Hedonist and childhood friend of Musashi. Assumes Sasaki Kojiro's identity after a dying Tenki entrusts Kojiro's swordsmanship certificates to him. 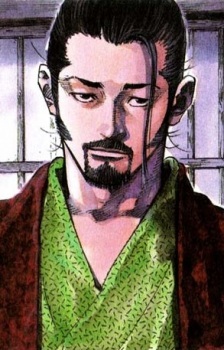 Later, after coming into contact with the genuine Kojiro, begins to identify himself as Sasaki Koujiro, an interpreter for Kojiro, the real Kojiro being deaf. He later becomes estranged from Musashi after a tense reunion, Matahachi displaying an intense jealousy to Musashi.